Many of the best parties are held by people turning 40. Why? They know how to go large and be flamboyant. By the time 40th birthdays roll around your mates are returning to their partying ways post child rearing and chasing the career ladder. They’re ready (again) to be true party animals and they will relish a good party theme – including the fancy dress. There’s something here for every party animal. Fill your venue with Heroes and Villains themed party style props. Captain America, Hannibal Lector and Poison Ivy should feature large. Hosts and waitresses send anyone who’s misbehaving to jail. A generous dance space with Gotham style roof top, smoking chimney and industrial styled seating will set the scene. A roaming saxophonist, top DJ and shot girls are essential to keep the party at a high octane. See more photos from this Heroes and Villains themed party that we created at a photographic studio in London. Zone your party space into three spaces for each of themes. Your chavs area should sport a giant flat screen, preferably showing reruns from the worst of Jeremy Kyle. Adorn this space with gaudy gold chesterfields a dart board and discarded crushed cans of special brew. The wags palace needs to be dominated by 12’ long white chesterfields and contemporary minimal floral arrangements. A grand toff styled columned and draped space will suit the dance floor surrounded by bookcases, hunting trophy animal heads. This theme works especially well if you have some party guests who you know will not be keen to on fancy dress as the them provides a wide range of easy options, including pretty wag dresses and gentlemen’s black tie attire. Take a look photos from each of the themed areas at this Toffs, Chavs and Wags themed party. Celebrate Gatsby extravagance with great party styling. Start with beautiful gold embossed invitations. On the night, guests enter the party through a gold statement entrance arch with photographer and dance troupe. A gold mirrored dance floor, high-end sumptuous decor, period furniture and theatrical props complete the styling. 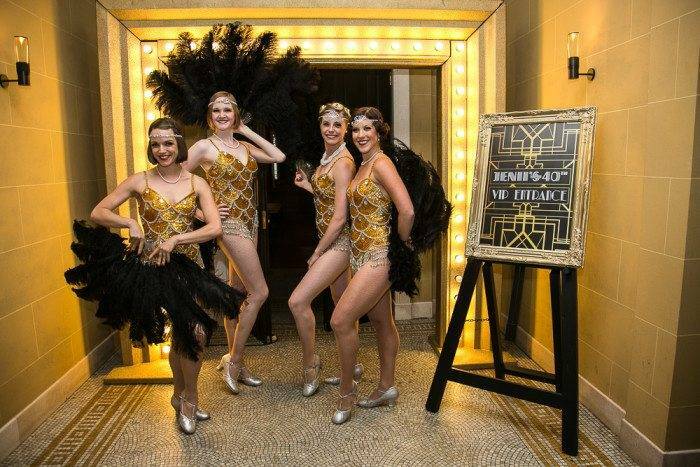 Showcase themed entertainment throughout the night, from flapper girls, band and DJ to Gatsby styled dancers. 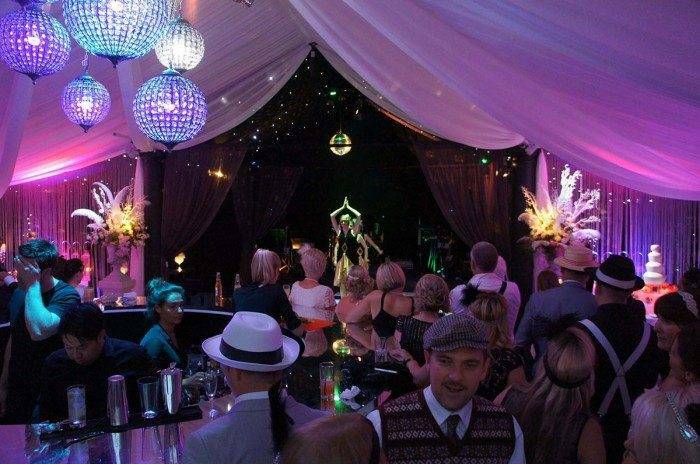 Take a look at more photos from this Gatsby themed party, created for a surprise 40th birthday. Inject Western styled fun into your party with a Wild West theme. An outside space can lend itself to this saloon style celebration. Western props, line dancing and Daisy Duke styled shot girls ensure everyone gets in the mood. 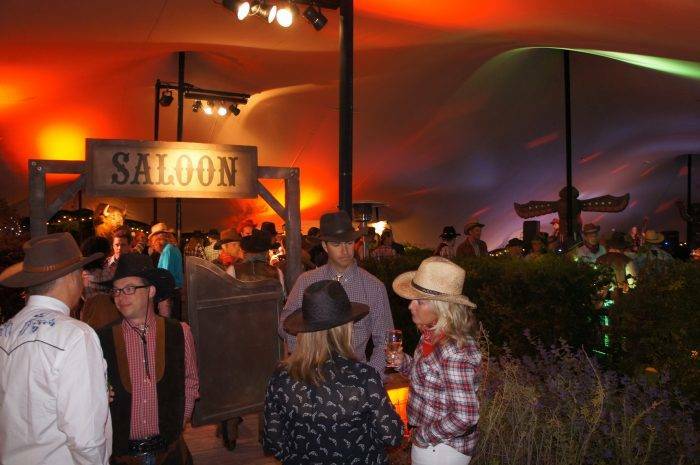 Have a look at what we did for this Wild West themed 40th birthday party. A night of decadent splendour with all the opulence and elegance of the Baz Luhrmann film. Have 1920’s styled Gatsby Girls greet your guests. Have your party band play popular dance anthems from the 80’s, 90’s and right up to the present day. A mirrored central cocktail bar should keep everyone buzzing. View more photos from this 1920s Prohibition inspired surprise 40th birthday party. We’ve produced many wonderful 40th birthday parties over the last 30 years for clients who’ve wanted beautiful catering, amazing entertainment and stunning looking themed and styled parties. For a bespoke 40th birthday party we’ll work with you to understand your requirements and your priorities with regards to entertainment, catering, venue, styling and technical production. Get in touch today 01883 740400.